I fell victim to an interesting Instagram ad this week and ended up downloading a fitness app that catapulted me into this post. Perhaps it should not have been surprising to me that an exercise app demanded to know my weight before it let me continue. And perhaps I wasn’t surprised, I was just annoyed. Here is the thing. I do not know my weight. I have not for years. When I go to a doctor who wants to put me on a scale, I decide whether it is worth protesting, but if I do step on to the scale, I do not look at the information. Despite my disdain for our diet- and weight-oriented culture, I live in it, so I am susceptible to its tricks. So, if I know those numbers then I start to focus on them – about whether they are too much, about whether they are going up or down. And that is not how I want to spend my time or energy, so I just don’t. I prefer to measure myself by how I feel and how I can move and by whether I can do the things I want to do with ease. I like to work toward getting better or more effective at something rather than trying to reach a certain weight. I know I am likely preaching to the feminist choir here, but sometimes things bear repeating. And I can see times when it would be useful to know your weight (or for someone to) – if you were receiving anesthetic, if you were deciding how many ceiling hooks were needed for your yoga hammock, if you needed safety gear, for example. However, I do not think it is useful for my app to operate that way. I get that many people are interested in losing weight and so they are orienting it to them. But even though I had selected getting stronger as my goal, I was still supposed to jump through the hoop of selecting my weight. And sure, I could have picked any old weight and put that in but I did not know how they were going to use the information to determine what the program showed me. I did not want inaccurate information to limit what was being offered. I did not want to have my challenges reduced or increased based on nothing. I wanted to be able to select a goal that was meaningful to me. However, the questions they asked limited what my goals could be. In fact, they limited what I could even think of as goals – at least within the program. And I am sure that it happens with some actual trainers and the like, too. The fact that so many people have been guided into wanting to lose weight has created a situation where program entrance questions are based on the assumption that weight loss is a standard goal. I would rather that the app (or a trainer!) ask me how many reps I can do of certain exercises and use that in their algorithms. After all, my weight tells them virtually nothing about me – nothing about my fitness level, my strength, my endurance, It gives them no useful information at all, just a quick metric that they can use to indicate that their program is successful. Added bonus: Going for a walk gave me the chance to take a photo of these rocks that had been covered by ice during a period of freezing rain. They look a bit like beach rocks. The thing that gets me, of course, is that it is not a good measure of success. It would just tell them (and me) about the difference in numbers. It would not indicate health, strength, or anything else that might serve me well. It would only give me a number that might soothe my brain (if I was into that stuff) or that might get other people off my case (if anyone around me was invested in my size). It irritates me (obviously) and it frustrates me because there are so many other ways to design a program so that it will serve people well. When I downloaded the app, I did not want all this thinking and wondering. I just wanted to see what the exercise was that they had in the ad for the app – it looked fun. I ended up just deleting the whole thing and going for a walk. That *was* fun. I achieved my goals of moving around and of being outside, AND I didn’t have to weigh myself to participate. 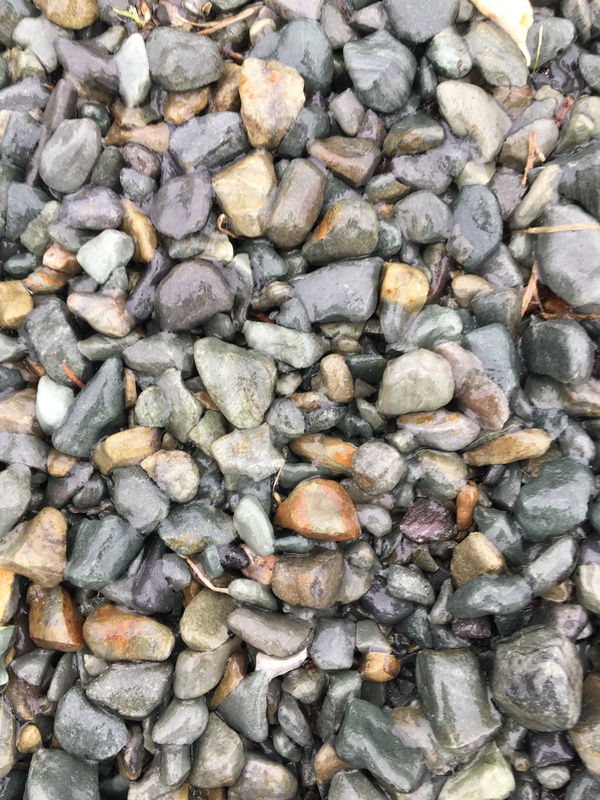 Plus, I got a cool photo of some rocks. Note: Knowing your weight might serve you well. It does not serve me well.